There are many strong historical female figures in the Piper Houdini novels. But in Celebration of International Women’s Day, I wanted to recognize a pioneer who paved the way for other women to follow. I am speaking of Jean Conan Doyle, the daughter of Sherlock Holmes’ creator Sir Arthur Conan Doyle. Though she is only 13 years old in the novels, Jean (who called herself Billy in her early years and was described by Houdini as a tomboy) grew up to be a woman of great accomplishment. Jean (Billy) Conan Doyle with her father Sir Arthur Conan Doyle, mother Lady Conan Doyle (Jean Leckie), and brothers Denis and Adrian (May 4,1923). Despite trouble with her eyesight (which her father, a trained optometrist, never diagnosed), Jean’s first 17 years were happy ones. She attended her Aunt Ida’s school, Granville House in Eastbourne, where she took after her Spiritualist mother in developing a love of nature. As a schoolgirl, she was a classmate and friend of Joan Boniface Winnifrith, who later became the film and television actress Anna Lee. 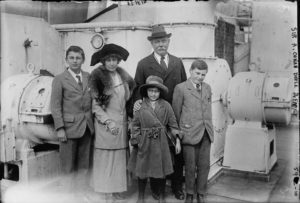 She was devoted to her father and traveled the world with him on his Spiritualist tours to Australia, America, and South Africa. 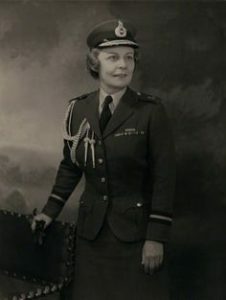 After Sir Arthur’s death in 1930, Jean remained at home with her mother until 1938 when she joined the Women’s Auxiliary Service of the Royal Air Force. She served in the RAF for thirty years and worked in intelligence during World War II. Commissioned a section officer, she was promoted to temporary flight officer in 1942 and to temporary squadron officer in 1944. After the war, Jean served in Germany with the British Air Forces of Occupation and then moved to the Technical Training Command. She served as Commanding Officer of RAF Hawkinge from 1956 to 1959, and on April 1, 1963, became the head of the Women’s Royal Air Force—the first Director to have risen through the ranks. On April 29 of the same year, she was appointed an honorary Aide-de-Camp to Queen Elizabeth II, serving until 1966. On 1 June 1963, she was elevated to Dame Commander of the Order of the British Empire (DBE, Military Division), and was known as Dame Jean Conan Doyle. She gained the additional sobriquet “Lady Bromet” upon marrying Air Vice-Marshal Sir Geoffrey Rhodes Bromet (1891–1983). Jean passed away on November 18, 1997. A simple gravestone in the All Saints Churchyard in New Forest bears her name and that of her husband, near the cross which marks the site where her mother and father lay. Her will stipulated that all copyrights she owned of her father’s works were to be transferred to the Royal National Institute for the Blind. She had no children and the Conan Doyle line died with her.